I picked this book from our over-crammed bookshelves nearly at random. Being both an avid book collector and a painfully slow reader, scanning our bookshelves is, for me, much like perusing the books in a second hand books store. I recognise few, have read fewer. On this particular morning, as I rushed out of the door and off to work, it was the size of the book that mattered to me. 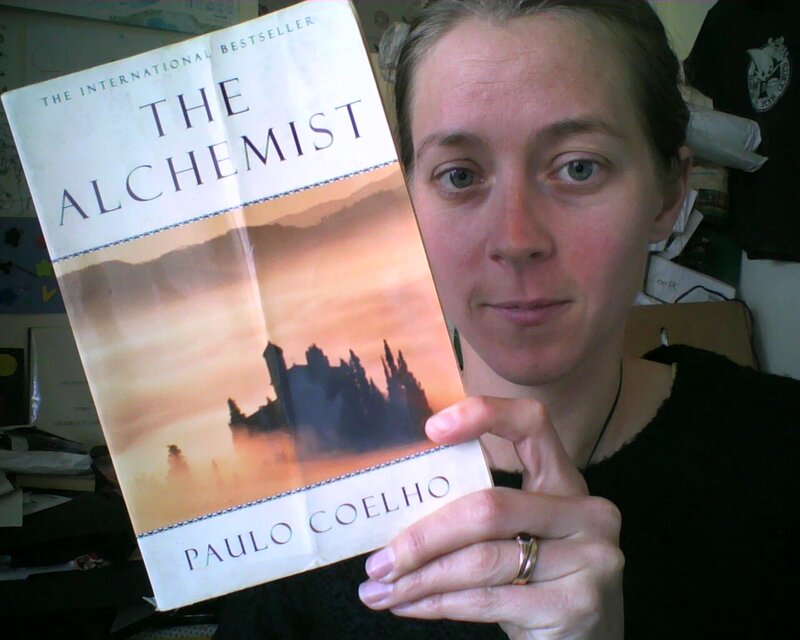 The Alchemist is seductively thin, with large font. The story follows the journey of a Spanish shepherd boy who has a recurrent dream about finding treasure near the Egyptian pyramids, and, considering this as an omen, trades everything he has for the opportunity to live out his dream. His path takes him across the Straight of Gibraltar to Tangier, and then on across the Sahara Desert. It is a journey of spiritual learning, self-discovery, and a whole lot of omen following. A shepherd may like to travel, but he should never forget about this sheep. Treasure is uncovered by the force of moving water, and is buried by the same currents. The story is all about the boy fulfilling his ‘personal legend’, and I found myself questioning my own decisions in life, and wondering if I wasn’t somehow hampering my own journey to happiness. It does get rather spiritual by the end, but the story seems so fantastic (and by that, I mean a piece of fantasy) that it didn’t make me squirm. The boy even starts talking to his heart in a literal sense (and the heart talks back… such a wise heart he is, too…). The story is told in a linear fashion, and (except for the occasional exception) only from the boy’s perspective. A precedes B, and C follows. There are no flashbacks, no asides in which the boy reminisces about things from his past. Usually I find this kind of storytelling incredibly boring (Alice in Wonderland makes me want to set fire to my own foot), but for some reason I wasn’t bothered when reading The Alchemist. It gives it a very Old Testament kind of feel (maybe even on purpose). Although the book in many ways seems quite serious, I got the sense that the author was having a bit of fun. At one point the boy reads a book, and is annoyed that some authors introduce too many characters’ names on the first page. It then suddenly occurred to me that I didn’t even know the boy’s name (it’s Santiago, given on the first page, but then never used again). From then on I noticed that characters weren’t given names. They were simply “the Englishman”, “the alchemist”, “the crystal merchant”. “The old king” was given a name, but he later regrets that he didn’t remind the boy of it, because he knew the boy would have forgotten it (and of course by this time I had forgotten it too). The only person who was referred to by her name was Fatima, the boy’s love interest. Yeah… maybe not that line, Paulo.